Jecca Ostrander has a string of cowhorses that double as show horses. From left to right: BoxO Heavens Angel (Ethel), BoxO Heavens Blue (Burnt), and BoxO Valentines Cat (Savannah). When Jecca Ostrander married her husband Cash Ostrander, she didn’t know that the string of cowhorses she brought along would earn her the acclaim they have in the past few years. The cattle ranch in Gordon, Neb., has born the name Willow Creek Ranch since the late 1880s when the first Ostrander laid roots there. Box O Quarter Horses is the horse business Jecca and Cash built since the start of their marriage. 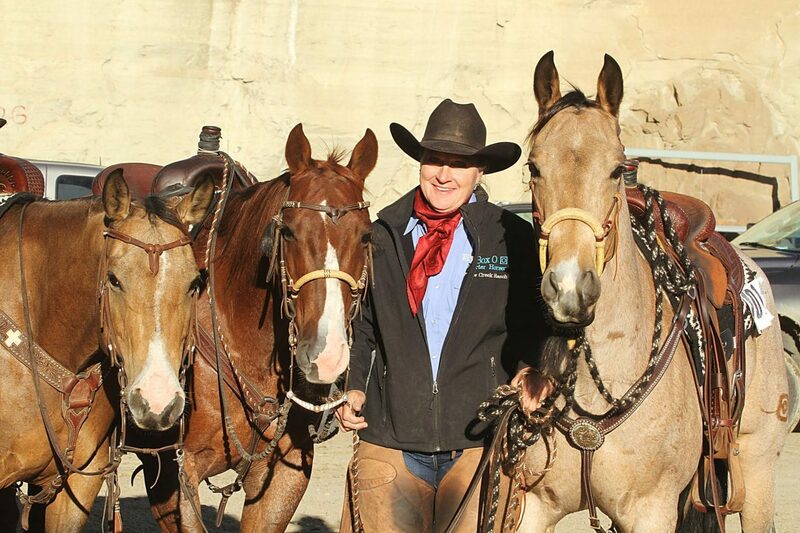 Box O Quarter Horses is the inaugural recipient of the 2016 AQHA Ranching Heritage Breeder of the Year. From her start as a self-proclaimed crazy horse lady, to a woman with a herd of exceptional working cow horses, Jecca’s 35 years of effort is paying off. Burnt is a home-raised gelding with the registered name BoxO Heavens Blue. Jecca said he “got sunburnt as a baby and it stuck like bubble gum.” Burnt was the first horse Jecca tested the waters in Ranching Heritage Challenge Events aboard and she is still showing him. Box O’s main stallion is SNW Heavens King, purchased in 2004 as a colt from Stan and Nancy Weaver in Montana. He is a grandson of Smart Little Lena, a great-grandson of Peppy San Badger, Peponita and Gay Bar King. He has been shown in ranch horse competitions locally but otherwise doesn’t have huge accolades, Jecca said. Box O’s most decorated offspring is BoxO Valentine’s Cat. She is by Palo Duro Cat and out of some of their oldest lines. Savannah’s mom is Tracis Blue Roan, a daughter by Roan Ambrose, who was a daughter by Blue Valentine. Jecca’s niece’s husband Clay Volmer had a hand in Savannah’s successes. “Savannah was very trainable, and her athletic ability was very good as well,” Volmer said. “That mare also was the first snaffle bit horse that I ever trained and showed, so she was very forgiving in the fact that she would allow me to learn in the show pen along with her. Volmer has four prospects within his program for the Snaffle Bit Futurity this year, one of which is Jecca’s upcoming stud, Opus Cat Olena. He is a 3-year-old by WR This Cat’s Smart, out of a Smart Chic Olena daughter. As a musician, Jecca was drawn to Opus because of his name. The Ostrander kids have grown and left the house, but one of their children, Stetson, lives on the ranch with his wife Courtney and their daughter Tenley. Sterling, their middle son, and his wife Allie live in Rapid City, S.D. The youngest son, their adventurous one, Jecca said, is in Manteo, N.C., working as a commercial pilot flying banners. Sale information on horses can be found on Facebook at Nebraska Quarter Horse Classic Sale. The Ostranders are continuing work as normal after their trek to San Antonio, Texas, in March to collect their award. Jecca has since competed at the Ranching Heritage Finals at the Houston Livestock Show. It’s back to business as usual.